Now that you have your perfect wedding dress selected, it’s time to start thinking about your bridal party. 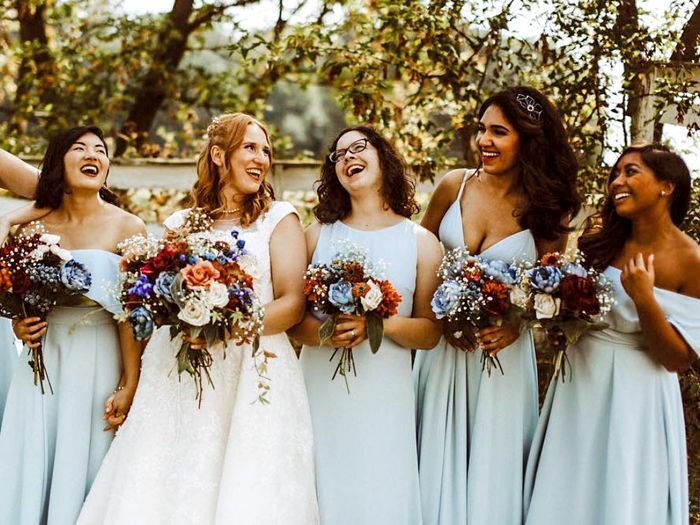 There are so many bridesmaid dress styles out there that it’s near impossible to choose the best one for your big day, let alone start looking into the trends au moment. From deep black to bright red to florals and a full-white wedding alike, looks run the gamut when it comes to those you’ve selected to stand beside you. While you want it to play off your unique wedding dress design, a lot of the selection process for bridesmaid dresses has to do with your chosen locale. As such, we’ve rounded up the best bridesmaid dress styles for every type of wedding. Are you getting married in the city? Consider a black-and-white palette. For the beach, look for more of a bohemian vibe. And for those of you who have chosen to take your other half straight to city hall with a witness or two, you still want those best friends to look the part. For all those wedding types and more, here are five bridesmaid dress styles based on the most popular wedding styles. For the one (or maybe two!) who you want supporting you as a witness during your nuptials at your local City Hall, it’s a sure bet they’ll choose their own dress, but—as best friends do—they’ll ask you for advice because, well, photos. For this kind of a wedding, let them choose something fun and bold that’s both dressy and whimsical. Just because a city hall wedding might not be over-the-top doesn’t mean you can’t have a ton of fun with the fashion. Available in sizes XS yo XL. Play off the greenery that is a vineyard and the blue skies above and infuse another bold color into the mix with your bridal party. We are currently loving a group dressed in bold red from slip dresses to more statement-making silhouettes and everything in between. Channel that edgy vibe and consider dressing your entire wedding party in black. Not only will these most definitely be a selection of dresses your nearest and dearest will wear again—from a black-tie affair to a festive cocktail party—but the stark contrast between the deep hue of your bridesmaids and the bright white of your wedding dress will be jaw-dropping. If there’s ever a moment to dress your entire wedding party in white, it’s a beach wedding. Think: ethereal mermaids. In fact, you might even want your wedding party to go sans shoes for the occasion. We love casual and flowy silhouettes and fabrics for this one. Play up the theme and opt for florals. In soft tones of pink, blue, green, it’s the theme of the season. We love a look where each party member is coordinated yet not matching—much like the floral arrangements in the garden themselves. After shopping for these bridesmaid dresses, you might even want to pick one up for yourself!